All Assam Tai Ahom Students’ Union took out a torch light rally in Namrup of south eastern Assam. 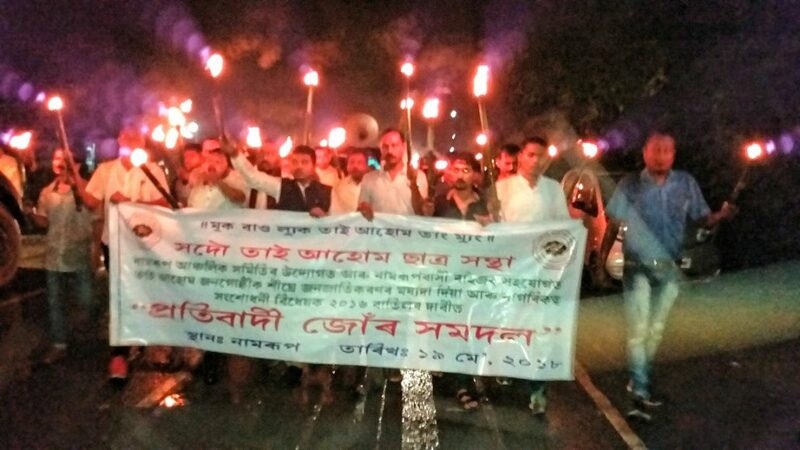 The torch light rally organized by the Tai Ahom Students’ Union regional committee was joined by hundreds of locals who took to the streets protesting against the controversial citizenship bill. Among those who led the protest rally were Tai Ahom Students’ Union regional committee president Jagat Gogoi, Tai Ahom Students’ Union regional committee’s regional secretary Mrinal Handique , All Assam Tai Ahom Students’ Union Naharkatia subdivision committee Secretary Rajib Ranjan Gogoi among others.